Give this page a read before you buy your first fish tank heater. Ok people, so here we are going to be dealing with possibly the most risky piece of equipment you will need in your aquarium. Yes, an aquarium heater is essential in just about all conditions, unless you have chosen cold water fish or live in a really hot climate. Most fish will live comfortably in temperatures of between 22-29°C. Do some research on your specific fish types, some species prefer a very narrow temperature range and even more important if you plan on breeding. Now I say risky because of the fact that you may essentially be sticking a live piece of electrical equipment into water. This all depends on what type of heater you purchase though. While I have never had any incidents with my heaters, safety is always something I consider. It may just be my childhood memories of a wire hanger and a wall socket that keep popping back in my head! With that said, just follow the operating instructions for your fish tank heater and you won’t have any problems. Every fish tank heater must be accompanied in the tank by a separate Thermometer. This is important to make sure that your heaters are set to the right temperature. The temperature must also be checked every day so that problems are detected as soon as possible. All heaters will have a thermostat switch on it. This switches the heater on and off when it’s needed. Most thermostats are adjustable so that you can set it to keep the tank at the temperature that you need it at. We talk about aquarium heater size, but we are not talking about physical size. We are rather referring to the power output of the heater, which is measured in Watts (W) . The bigger your tank is, the more Watts of energy you will need to keep the temperature consistent. I generally use the formula of 5W per gallon of water and I haven’t had any problems as yet. If your ambient room temperature is very low and you find your fish tank heater never gets the tank up to the desired temperature then you may need to buy another one. The lower the room temperature the harder the heater must work to keep the aquarium warm. Remember that heaters have thermostats built into them so that they will switch off when your fish tank temperature is right. So you don’t need to worry too much about over sizing your heater. Under sizing, on the other hand, is a problem. The heater will stay on constantly and your tank will never reach the right temperature for your fish to live comfortably. The table above shows some heater size recommendations based on the 5 Watts/gal theory. If your ambient temperature is too low you may need to increase the size of your heaters. 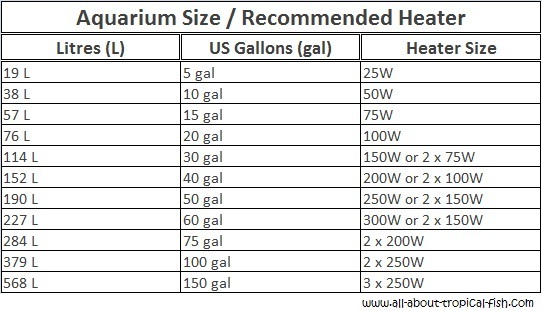 You will notice that in the ‘Heater Size’ column that there is a recommendation to use multiple smaller heaters instead of 1 large fish tank heater in your aquarium. My reasoning for this is in case of a mechanical failure of the heating element or the thermostat. If the element doesn’t switch on or it gets stuck on, the effect on your tank won’t be as quick as if it happened with 1 large heater. So the temperature won’t rise or fall too quickly. You should be able to fix the problem in time before any damage is done, provided you check your tank conditions regularly. I hope this information comes in handy when it’s your time to choose a fish tank heater for your aquarium.